CAPE CANAVERAL, Fla. — Ever since Space Exploration Technologies (SpaceX) encountered the first failure of its Falcon 9 rocket on June 28 of this year, the space community has waited to see how long it would take the NewSpace firm to get back on its feet in terms of launching payloads to orbit. That wait appears to be just about over. The launch of 11 Orbcomm Generation 2 (OG 2) satellites is tentatively being slated for no-earlier-than Saturday, Dec. 19. The Hawthorne, California-based firm is looking at conducting a static test fire of the Falcon 9 at Cape Canaveral Air Force Station’s Space Launch Complex 40 (SLC-40) on Dec. 16, according to a report appearing on CFN 13 News. This announcement follows a tweet issued by the company’s Founder and CEO Elon Musk posted earlier today. Before the “overpressure event” (explosion) of the CRS-7 Falcon 9 about five and a half months ago, SpaceX had been increasing the pace in which it was launching payloads to orbit. The accident was traced back to a strut in the rocket’s second stage which failed, causing a helium tank to break free. SpaceX has worked to diversify its capabilities. 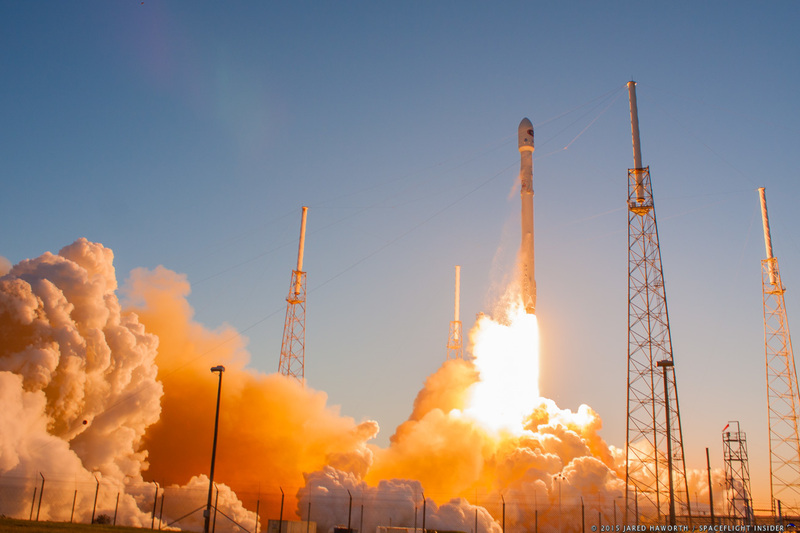 Commercial satellite launches, missions to the ISS – carried out by the firm’s Falcon 9 v1.1 and Dragon spacecraft – and even the beginnings of potential Department of Defense missions were either being developed or actively being carried out. The complete loss of the Falcon 9 rocket, the Dragon cargo carrier it carried, and the roughly 4,000 lbs (1,800 kg) of supplies and experiments bound for the International Space Station put a halt to that. It also meant that the rate of launches, which SpaceX had been increasing, dropped back to roughly 3 launches per year. SpaceX, however, has never been a company about accepting setbacks or resting on its laurels. With this upcoming launch, the firm is looking to not only return to the business of launching rockets but also to continue innovating the means in which that business is conducted. For the upcoming Orbcomm OG2 mission, SpaceX has suggested it will work to conduct its first ground landing (the company has already carried out four ocean landings on water and on an automated ship off the Coast of Florida) at the newly-renamed Landing Complex 1 (whereas the other historic launch sites are referred to as Space Launch Complexes). Stay tuned to SpaceFlight Insider for further updates. I thought they would be out of business in 6 months to a year. We will see. If it blows up again it is all over. There was nothing wrong with the merlin rocket engines. A strut failed inflight. But, don’t worry. They won’t be out of business in 6 months or more. Here’s hoping they stick that 1st stage landing attempt. One interesting thing that I think I read on one of the other stories (not sure if here or SFN) was that the SpaceX landing sequence doesn’t include a hover/pause. Blue Origin’s New Sheppard did include one in its landing sequence, I’m wondering if that brief pause to null rates might be important to sticking the landing considering the amount of energy they’re inbound with. The Merlin engine can’t throttle back enough for a full hover – so the phrase used by Elon Musk was that they had to “land at high g” – i.e. the landing is almost a reverse of take-off. Obviously this is a lot easier for Blue Origin, which needs only a fraction of the Falcon’s thrust, and it will be interesting to see if their higher power versions, which they would need for orbit (~100x energy), can still have enough throttle-back for a hover.